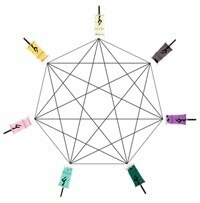 For almost 5 years, I have had the pleasure of watching French jeweller/perfumer Olivier Durbano's tireless efforts in creating his Parfum de Pierres Poèmes - a series of olfactory interpretations derived from semi-precious gems. As a devout Durbano perfume loyalist, he has managed to capture my heart, my imagination (and my nose!) with his unexpected and inventive perfume renderings, each of which demonstrate his astute understanding of his gemstones both physically and symbolically. Now, upon the release of his seventh (and final) stone poem Citrine, I find myself at a crossroads: brimming with excitement, yet bemoaning the end of an era. Citrine is a quartz variety that varies from pale lemon yellow to a deep smokey amber, and metaphysically, is believed to purify and dissipate negative energy. It's golden hue evokes a feeling of celestial warmth, inner fire and and opulent radiance... characteristics which I feel Monsieur Durbano has sought to capture in the bottle. Citrine (the perfume) - as the name might suggest - opens with a spark of wild orange and sicilian lemon, but in trademark Durbano style, veers off into something unexpected and unique only moments after it dances on skin. A burnt-sienna note of elemi resin and carrot seed bring a richness and depth to the topnotes, dispersing the citrus components and turning what might have been anticipated into the unforseen. Warm mimosa, beeswax and fragrant woods imbue the heart with a blonde solar radiance, whilst a huff of myrrh and ambergris furnishes the perfume with its signature mineralic feel. There is definitely a feeling of antiquity here... one can imagine priceless Incan gold struck from the brown earth, refracting sunlight for the first time in millennia. Citrine is classified as an amber woody spicy fragrance, and I feel this classification is right on the money. Citrus notes only play a supporting role in this extraordinary creation... one that I feel is the most thought-provoking in the series, and certainly amongst Durbano's best. 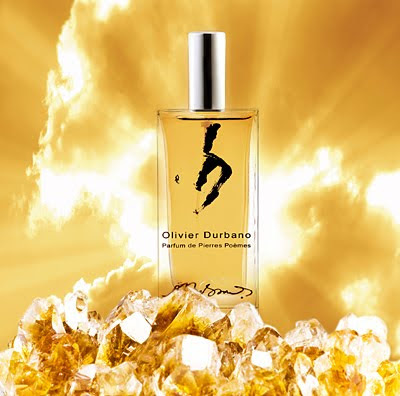 So, here we stand at number seven... sadly the last perfume in Olivier Durbano's series. As with all of his creations, Durbano's approach to his art is always carefully considered... number seven is a figure with spiritual and ancient importance, symbolising (to the ancient Egyptians at least) Eternal Life. I like to think in some way, that Olivier's 7 stone studies have come full-circle, creating a never-ending wheel or seven-pointed star; one whose uniqueness and innovation will shine like a faceted gem and endure all the ages. Available soon through select retailers in 100ml size.